I have the ipad, iPhone app, which is based on the 2006 edition. The proportions were a bit off. This came out more like chocolate milk than a shake. Start with half of the required milk - it may be enough. The Errata, corrected in the 3rd edition, omits the light corn syrup. This is a family favorite. I love how the lemon zest brightens the flavors. I've never tried the horseradish variation. Went with the variation that includes horseradish and it was pretty good. Nothing to write home about, but a nice simple dip with pretty good flavour. This needed a lot more olive oil to be smooth, I also added sage, thyme, lemon juice and salt because it was so bland. I use Southwest seasoning mix and add a little lime juice at the end. P73 This does not taste quite like the restaurant-style Texas caviar I was looking for. I am still playing with the recipe. Husband likes, though. Very easy and a party hit. I added mozzarella as well as parmesan. Everyone seemed to like these and they were easy to prepare ahead of time, then just throw into the oven as guests were arriving. They were only good hot--got kind of mushy as they cooled--and did not keep well. Pg 84 About 6 minutes in the oven yields a nice little shrimp that can be used as an app or entree. Basting with the sauce during cooking might add some more flavour. You could also up the citrus a little bit. Instead of purchasing store bought, as I usually do, I decided to make some myself as I had a stack of leftover corn tortillas needing to be used up. These were very simple to make and tasty. My main problem was that the tortilla wedges go from pale to dark very fast in hot oil. My third batch was the best because I realized they need just a few seconds to cook. I will definitely try these again whenever I’m having chili. Pg. 96 Basic and pretty good but you need to jazz it up a bit. I would add some herbs to the milk and broth mixture and let it steep in a warm sauce pan before making the béchamel. Also, salt your bechamel after tasting. Finally, double the mushrooms. This was tasty but quite rich. Takes healthy ingredients and makes them unhealthy. Slow-cooker recipe. Also needs 1C dry white wine. Pg 100 I didn't have the time or the inclination to do this in the slow cooker. Overall the flavour is pretty good, especially the slight heat. The dish is also very healthy and goes well with a nice piece of crusty bread. I would also consider adding a bit of cubed potato. Tweaked the recipe a bit to add a bunch of chiles. Very basic burrito. Good with leftover chicken. I agree with Sturlington that the recipe makes a pretty basic burrito. My husband and I like basic burritos, so this recipe was a hit with us. I really liked that it took 30 minutes to prep everything, heat up the burrito shells, fill the burritos, heat the filled burritos, and serve. There was also only one cooking pan to wash. A wonderful way to use leftover chicken and get a comfort food dinner on the table after a busy and draining week. I was looking for a new way to use leftover whole roasted chicken and was pleasantly surprised to find a “Leftovers” section in the Joy of Cooking index. This recipe made a delicious sweet and sour sauce that was thick and generous with pineapple, green bell pepper, and onion. My husband and I liked it very much. It was easy to prep and then cook in one large sauté pan. I made the accompanying rice in a rice cooker. Easy clean up. Fabulous, could go slightly easier on the bacon but just delicious. I've made this many times through the years whenever I'm in the mood for goat cheese. One of our family favorites. Comfort food, p112. Uses cooked chicken breast. Can substitute turkey breast. Top with Mornay Sauce (p551). Serve with broccoli or asparagus. Super simple but very nice in its own way. Spencer likes it a lot. Added a sprig of thyme. Added a bit of savoury to jazz it up a bit. The flavour is nice if a bit simple. Note that this soup requires the potatoes to be baked before starting. Therefore, a good use for leftover baked potatoes. If you are like me and didn't notice this before starting, and you just want a potato soup with baked potato toppings, it's probably better to make the potato and leek soup on the same page, substituting onions for the leeks, and then top with sour cream, cheese, bacon and chives. Also far less cream that way. Pretty good for a simple cabbage soup. It is lighter than lots of other recipes for cabbage soup and the leeks as well as the caraway give it a nice flavour. A good soup, but cooking time is too long for weeknight dinner. I liked the touch of curry powder. A good quick lunchtime soup. Uses leftover cooked chicken. I usually have the ingredients on hand. I substituted salsa for the tomatoes. Serve with tortilla chips. This is easy and cheap to make, and super tasty to boot. Used lemon olive oil for a nice zing. Really good flavor without a ton of butter or cream. Taste is pretty similar to cream of broccoli soups. About 75-90 minutes start to finish. Serve with a good bread. A nice, springtime soup, especially if you add some fresh shelled peas when you add the asparagus and you have it with some homemade croutons. I substituted a leek for the onion. The recipe doesn't call for either celery or nutmeg. The EYB index is wrong in that regard. Pg 144 This is a simple but tasty soup. It gives you exactly what you would expect from a cream of broccoli soup. I was a little worried about the amount of liquid but the texture worked out just fine. The flavour of the broccoli is very well balanced with the cream and butter. This was better as leftovers. Good with shredded parm. P159. Time to make: 10 minutes. Making the croutons is an additional 10 minutes. This salad was delicious, zingy in a way that the restaurant versions aren't any longer. The recipe does not make a lot of dressing; I cut it in half and it was barely enough for 2 side salad portions. I like that it calls for either an egg or mayonnaise, so it can either be more authentic or easier to cut down. I also used anchovy paste instead of canned anchovies. This salad calls out for some protein, as indicated in the headnote; I didn't have any meat, so ended up scattering a chopped hard-boiled egg on top. Really good. Leftovers don't keep. This was a hit with the husband. Make it a meal with bacon, croutons, and coddled eggs. I also added tomatoes and red onion to make it more substantial. Not quite as tangy as I would have liked, but a decent basic coleslaw recipe. I've always been a big fan of curried chicken salad and this is an excellent rendition. I went with the suggested mango chutney in the dressing and it was very nice. Also, the brief cooking of the curry powder takes the tinny flavour out of it. I did however go a tiny bit lighter on the dressing. Great little salad. Really bland as is: better with hot sauce, sriracha, green onions, etc. I would leave out the lemon peel and the radishes. Otherwise, it was alright and I'd probably make it again. This dressing could be used for other cooked green vegetables, such as green beans or bok choys. I omitted the sugar. The vinaigrette variation is simple and good. Bland. I think this would have tasted better without the pasta. May have to add a couple of tablespoons of oil. What's not to like? Open-faced cheese sandwich with bacon. Good accompaniment to soup. This is not really a recipe, just assembly instructions. This is a basic hot dog recipe. I cooked mine whole in a skillet and added ketchup as a topping. One thing I've never tried before is toasting and buttering the buns. It had a toasty, crunchy aspect that I liked. P566. Suggested with Huevos Rancheros, p196. A basic recipe but a good one. Reminds me of taco night when I was growing up. Pg 189 First thing to note on this one is that the recipe should be listed as tostadas and not tostados. That being said this is a very flavourful dish that comes together easily and quickly. Since it can be served cold it might be a good potluck or make ahead dish. I didn't fry the tortilla, I just grilled it but the result was very nice. A good marinade that really pleased the steak eaters in the group. I used the same marinade for chicken and it was also good. This works best if the eggs are just under done before adding to the spinach. Fast and easy with pre-cooked potatoes and peppers. I always omit bananas because they turn brown no matter what you do. Pineapple makes a good substitute for grapefruit, since not everyone can eat grapefruit. This was a nice little salad but go lighter on the grapes and up the citrus. Also good with some honeydew melon. I served this with a steak and followed the recipe closely, except that I riced the carrots and potatoes together before adding the liquid and butter. I used milk and butter and it was just fine texture wise. A very good way to get a starch and a vegetable in one side. I used my wok for this as you definitely need to simmer/steam at the end. The ginger and garlic were nice and the texture of the asparagus was good, but be very careful not too overcook. Needs more punchy flavor. A bit bland as-is. Broccoli takes about 8 minutes in the steamer and results in just the right texture for stir fry. The sauce is very nice and the result is an excellent Asian side that has great flavour. Finish on the stovetop and omit the sour cream and caraway seeds. P263. Fair bit of prep time, but the results are easy and tasty. Cheap ingredients. Great side dish, especially the variation with grated cheese. Nothing to write home about. Flavour is ok but you would need to go a bit heavier on the olive oil and the parm to give it more pep. P278. Very good with kale; also can be made with chard and beet greens. Time to make: ~15 minutes. I liked the variation with soy sauce added. Must remember to take it easy on both garlic and red pepper, although tasty nonetheless. Leftovers keep well and are good eaten cold, as a salad. Parsnips were quite nice, super strong flavour without being over powering. Could braise covered for only 20 instead of 25 and then finish uncovered for a bit longer than 10 minutes. Spencer didn't love, but that was mostly about parsnip. I used cooked barley and cajun seasoning in place of the cooked rice and curry powder. I also used some homemade vegetable stock. These turned out spicy and savory. The mixture of the barley, veggie stock, and Parmesan really was delicious. I was in the mood to make a side dish with what I had in my cupboard and pantry, and found one with recipe II. I’m usually not a fan of dishes that use prepared soups, but this was rich and satisfying. I used russet potatoes with wonderful results. A nice comfort food on a very cold December night. Great for a crowd. Nice simple flavour that worked very well with homo milk. Nice crust. These potatoes were very easy to make and the recipe made a large amount. I had meatloaf and salad alongside. There was even enough leftover to have breakfast the next morning. Potatoes with a poached egg on top. Mmm. An easy way to use up leftover potatoes. Mashed potatoes are not required--just mash up the cooked potatoes before making the cakes. I didn't need additional liquid beyond the egg to bind it all together. Coated in flour and a little breadcrumb before frying. Tasty with eggs. i tried the version win broth and while it was decidedly less creamy it was much lighter it still very tasty. This was pretty good. It uses egg as the thickener instead of flour, lending the entire dish a creamy texture and delicious taste. A little more labor intensive than the baked varieties of mac and cheese, but not by a lot. I use crumbled cheez it crackers for the topping. This is very rich, and very good. Must make a cheese sauce, which is a different recipe. I never have vodka in the house so I have made this countless times with chicken broth as a substitute. Depending on who I am cooking this for, I will sometimes leave out the onion. The dish is just as good without it. The sauce is also really great with farfalle pasta. There's really no way to go wrong with this dish. It is quick to prepare and simply delicious. Quick and easy. Really good. Quick, easy and really good. Pg. 331 I was surprised to find this dish in Joy of Cooking as the ingredients were all quite authentic. I love black bean and chilies together, and partner loves noodles so we thought we would give this a try. Delicious dish with just enough heat (I used two serranos) and a nice savoury hit from the garlic, ginger, black beans. I did steam the green beans for 3 minutes before stir frying as I was worried they would be too firm otherwise and this approach worked well. My challenge was the noodles, since I used fresh noodles they were a huge hassle to separate and I ended up with a bit of a mess. The dry noodles likely wouldn't cause this problem so I see why they suggest dried. Next time I will follow this direction but perhaps up the noodles to 10 oz dried. p. 335 -- My first time attempting to make spatzle, since my boyfriend had never had it before! Halved the recipe and it served two of us as a side perfectly. I did a combination of pushing the batter through a large-holed colander and drizzling with a spoon, which gave a nice variety of lumps. I only did the basic version (boiled) so I'd be curious to try one of the variations next time that have you sauté in butter or bake with cheese. Makes enough to fill 12 shells. Use premade tomato sauce. Reduce amount of cheese. Bake at 400 for 30 minutes. Very easy to make. I scaled down the recipe and made "individual" lasagnes in smaller pans. One had sausage, one was meatless. Both were delicious. Leftovers were frozen. A family pleaser! This is by far the best lasagne I've made. The recipe is so simple and easy to put together and it tastes amazing. I used homemade ricotta from Smitten Kitchen and jarred tomato basil pasta sauce. I also used no-boil noodles and it worked like a charm. Served with garlic and herb toast. Delicious with a nice smoky eggplant taste and a creamy ricotta filling. I went a bit lighter on the cheese and it was fine. Would add a bit more tomato sauce. Very simple to do and achieves the simple wholesome goodness of Granola. Served in a fruit and yogurt parfait and it was great. This recipe s pretty good with a bit of tweaking. You added more worcestershire, doubled the hot sauce and the tomato paste. You can also put less stock, maybe 1 to 1.5 cups. Pg 399 This is somewhat of a one pot recipe which makes a pretty good dinner but it does cry out for a sauce. I served with a a sauce ravigote and it worked well. I did have to crank the heat in the oven a bit to brown the potatoes and fish a bit. I would actually suggest simply pan frying filets and roasting the potatoes and onions, this way you will get more colour and better flavour on all components. No fuss no mess, very easy to do with a great little sauce. I liked everything about this sauce except for the sole. the sauce and creamed spinach with the au gratin were all great but I have come to realize I don't like sole. I will likely try with tilapia or haddock and might try to steam or pan fry the fish but the components themselves go very well together. Very easy method for cooking cod and other white fish fillets. Takes the broiled fish recipe a step further. The bread crumbs add a welcome crunch to the dish, and it's not any more difficult or time-consuming than the original. Very good for a quick lunch, especially on thickly-cut caraway bread. The ingredient list should include lemons and onions. Fennel is optional, so it should be removed from the list. Not very good. Super tangy from the mustard and the lemon with a poor texture. Simple and easy on a weeknight if the marinade is pre made. Flavour is pretty good, but you broiled so you have to fiddle with the times (a bit longer) but keep an eye on it. Go a bit easier than they say on the lemon. I pan fried and then finished I the oven and it yielded a juicy and flavourful result that is more citrusy than traditional but still relatively tasty. This recipe contains an error corrected in the 3rd edition and posted on The Joy of Cooking website. To the paprika, bay leaf, salt, and black pepper, add 1 1/2 cups chicken stock or broth. Rather than using the sauce to marinate the chicken, I serve it more as a dipping sauce for pre-cooked chicken as well as various vegetables: carrots, peppers, broccoli, cucumbers, celery, snow peas would also be good. I usually serve with spaghetti or udon noodles, which can also be tossed in a bit of sauce. Very flavorful, easy and a family pleaser. P432. Can also be made with boneless chicken breasts. Time to make: <1 hr. Keeps up to 3 days for reheating. Comfort food, always enjoyed by family. There is one variation, with dumplings, that follows. P433. Very easy and tasty. Can be made with boneless chicken breasts. Time to make: <1 hr. The leftovers make a good pasta sauce. This recipe contains an error corrected in the 3rd edition and posted on The Joy of Cooking website.. Right after simmering for an hour and straining/reducing stock, SAUTE: 16-20 TINY WHITE ONIONS, PEELED and 1 POUND MUSHROOMS, SLICED in butter and juice of lemon. Continue as directed. Her method for doing the chicken breasts works super well so long as the pan is very hot. The sauce was done with half and half and it was still rich enough and quite nice. Quite quick to make. Used this recipe to make meatballs and it was good. I would also like to try the loaf version with a gravy or tomato sauce on top. This recipe is based on the turkey meatloaf recipe that immediately precedes it. The recipe makes enough meatballs for 3 spaghetti dinners for my family of 3. I froze the extra. Family gave it 5 stars. The errata corrected in the 3rd edition makes this change: After roasting for 30 minutes, REDUCE THE OVEN TO 350F. This line was crossed out: about 2 hours 15 minutes for medium rare. Okay but not super flavorful. Nice and simple to put together with really good flavour. Portion is relatively small but adequate if accompanied by something like a roll. Pg 503 Served this with the herb pan sauce from the same book and it was pretty good. I think doing the whole thing on the stove is messy and takes a bit too long. I would suggest searing then finishing in the oven. Pg 503 There are a lot of nice things about this recipe. The sprice rub works very well with the pork, and the dredge and fry approach results in a juicy and flavourful piece of meat, which is not always the case with tenderloin. The only oddity is the butterflying of the pieces. I suppose you get more of a strip shape, but really I don't see why one couldn't do medallions. Butterflying isn't much work, but also doesn't add much. I was expecting this chili to be quite different from my regular rendition since it involved a bottle and a half of dark beer and 8 oz of bacon, two things which I expected woudl create a great depth of flavour. Unfortunately this didn't happen. At the end of the day the chili was good, but it wasn't anything special. The beer (despite using a very dark brew) and the bacon (despite the large amount) were entirely imperceptible. Moreover, there were a few ommissions or oddities in the recipe. Firstly she calls for you to brown the bacon and set it aside, but she never says to put it back in. I ended up garnishing with mine. Secondly, she has you brown the meet and aromatics in a pan, then deglaze, and then move it all to a dutch oven. I didn't understand the point of this. Why not simply brown in the dutch oven, discard some of the fat, then deglaze and continue with the recipe. I won't repeat this one, it is more work without any additional flavour. I thought it was fine, and pretty easy. Husband didn't like it as much. Next time try bulk sausage instead of link. I used pinto beans instead of red kidney beans, because I couldn’t find my kidney beans. It was really good. Pg 547 I used the cream and the mustard that were listed as optional and I really think they are necessary to bring good balance to the sauce. Great compliment to the pork tenderloin. Pg 599 Takes a bit of time but yileds a very flavourful sauce that is excellent on fish or chicken. This recipe contains an error on page 560 corrected in the 3rd edition and noted in the Errata on the Joy of Cooking website. Along with the egg yolks and water, add 4-5 TEASPOONS FRESH LEMON JUICE. Delicious, easy to make and freezes well for use in multiple recipes. My go-to standard. If you have canned tomatoes, fresh basil, parsley, garlic and olive oil, you can have a yummy pasta sauce in minutes. Simple and easy marinara sauce used to top spaghetti with turkey meatballs. It went over well with the family. You will need a cup of sugar too. Also, it is quite a large amount of vinegar that required. I made this vinaigrette with dill and used it to marinate grilled chicken. The chicken was moist and juicy, absolutely how grilled chicken should taste. Very nice if a bit involved because of the frying of the shallot and garlic and the reducing of the lemon juice. I would say you should only plan on making this if you are doing it in advance. Good but the parsley made it turn greenish. Next time I would stir in rather than blend in the parsley. P577. Tasty, especially with tarragon Dijon mustard, but requires a bit of thinning. I added a tablespoon of olive oil. Keeps. well. Yogurt and milk can be substituted for sour cream and buttermilk. This is a very light and refreshing dressing. This recipe is very similar to ranch dressing in my opinion. It is very creamy and has a bit of a tang from the buttermilk. I halved the recipe and used dried parsley and dried dill because I didn't have either of those fresh. I can only imagine how wonderful it would taste with all fresh herbs. Quick and easy, I will be making this regularly. I used this as a dip for fried, pickled okra. This was a very thick and creamy dressing that was good as a dipping sauce. I used black pepper instead of white pepper since that is what I had on hand. Used for macaroni salad. Too much mayonnaise. I cut it with plain yogurt (2 parts mayo, 1 part yogurt). Needs salt and pepper. Rice wine vinegar is good in this with the yogurt. Sugar is not necessary. Very nice curry mayo, especially with the chutney variation. The brief cooking of the curry powder takes the tinny flavour of the preground spice out. Very nice. Put this on a piece of salmon and it was very flavourful. It seems very authentic but you might want to go a bit lighter on the garlic. Also, be careful with fish as it will definitely overpower it easily. Nicer than the premade mixes that are usually too tame and a bit heavy on the salt. I also tried the blackening instructions that are refunded in the recipe and they worked perfectly. Much more citrus than most jerk pastes. Overall quite tasty if not super authentic. I went with 4 serranos as I couldn't find scotch bonnets. This recipe on p. 596 contains an error corrected in the 3rd edition and posted on The Joy of Cooking website. Along with the milk, sugar, shortening, butter, and salt, add 1 CUP WATER. The printed 5-6 cups of all-purpose flour was later corrected to read: 6 - 6 1/2 CUPS ALL-PURPOSE FLOUR. This recipe contains an error corrected in the 3rd edition and posted on the Joy of Cooking website. Instead of making three 9X5 loaf, this recipe actually make two loaves. This recipe contains an error on page 613 corrected in the 3rd edition and noted on The Joy of Cooking website. Slice the rolled dough into 3/4 inch slices instead of incorrect 1 1/2 inch slices. Quite light for whole wheat, with a nice crumb and a great size. Freezes super well. Simple and delicious. The bread stays fresh and moist for at least 24 hours. When baking it, check for doneness 10-15 minutes earlier than indicated or it might burn. Indexed ingredients should include lemons. Quite possibly the easiest quickbread in the universe to make, and that's saying a lot. Edible, not amazing. Note the website errata for this book: you want two teaspoons of baking powder, not tablespoons. The errata corrected in the 3rd edition changes the amount of flour to 2 CUPS from the incorrect 1 2/3 cups. Simple, quick and good. This a versatile recipe for weeknight cornbread. I usually have the ingredients on hand. Can be made with sour cream or plain yogurt. These are a bit more work but the result is rich and cake like. You might want to use muffin liners as they tend to stick some. Spencer likes these a lot. Like cinnamon toast but with orange juice. This would probably be better with brown sugar. I used fresh-squeezed orange juice. A kid-pleaser. This recipe on page 644 contains an error corrected in the 3rd edition and noted on The Joy of Cooking website. Add 1 3/4 teaspoons baking powder, not the incorrect 1 3/4 Tablespoons. These little pancakes were easy to make and a savory addition to breakfast-for-dinner. Will make again. Prepare 2 hours in advance. Deep-fry. Struesel: Brown sugar, no cinnamon or nuts. Store cupboard ingredients include cream of tartar and lemon juice. This recipe contains an error on page 707 corrected in the 3rd edition and noted in the Errata on the Joy of Cooking website. The baking time should be ABOUT 25 MINUTES FOR TWO ROUND PANS, 40-50 MINUTES FOR A SPRINGFORM OR TUBE PAN. An adaptable recipe. Can add dried fruit and nuts or omit, use brown or white sugar. The cake is moist and not too heavy, a good snacking cake. This is a moist cake, filled with nuts and carrots. I used pecans in place of the walnuts and left the pineapple out. I topped these with a cream cheese frosting. It didn’t look pretty, but man did it taste great! Sooo good! I would definitely make it again. I used a Sugar Pie pumpkin from my garden. The cheesecake made Thanksgiving extra special! This recipe contains an error on page 756 corrected in the 3rd edition and noted in the Errata on the Joy of Cooking website. The first ingredient should read "...or 2 large eggs plus 4 large egg YOLKS". Instead of strained fresh lemon juice, the recipe was corrected to read STRAINED FRESH ORANGE JUICE. Also search under lemonade and lemon cordial. Good brownie, not overly rich, I feel like the majority of people will like it, as it's not too much of anything. I added the optional chopped pecans. I don’t think I’d ever made brownies with foil on the bottom. I had to cook them about 9 minutes longer than suggested. They were quite good, but next time I’d use walnuts instead of pecans. This recipe on page 767 contains an error corrected in the 3rd edition and noted on the Joy of Cooking website. The instructions should read: "Prepare Chocolate Chip cookies, above, OMIT THE BROWN SUGAR AND USE A TOTAL OF 1 CUP SUGAR. Add an additional 2 Tablespoons...." and so forth. Better the next. Chocolate chunks might be better than chips here. This recipe on page 769 contains an error corrected in the 3rd edition and noted on The Joy of Cooking website. In the beginning of the recipe, 6 tablespoons (1 1/4 sticks) of butter is incorrect and should read 10 tablespoons (1 1/4 sticks) of butter. We used these to decorate gingerbread cookies. The icing tasted just like the decorative icing used in bakeries, and it was very easy to work with. This icing was inedible. I'm not sure what I did wrong here, but when I added the powdered sugar to the melted butter and started to mix, the sugar solidified into a solid clump on my beaters. I actually had to knock the beaters on a hard surface to break it loose. I'm sure this was an error on my part, but I couldn't say what it was. The whole mess went in the trash. Very easy. Makes a nice sauce for pound cake and berries. Can be frozen. Takes ten hours in the oven. A slow cooker is a better choice. This is a variation of baked apple butter. Requires ten hours' baking time. Fast and easy. Everyone enjoyed them. all the variations are delicious but that is a given from bread butter and cheese. A good basic how-to for making croutons. Covers every variation. In the basic permutations , the croutons could use a little coarse salt. I believe this is from the sandwich suggestions at the beginning of the chapter. Good reference when making sandwiches. Practical, clever recipes have always been a part of this book’s 75-year history, but it’s evolved to include 30-minute recipes, make-ahead shortcuts, and a whole section on cooking and freezing food. Seventy-five years ago, a St. Louis widow named Irma Rombauer took her life savings and self-published a book called The Joy of Cooking. Her daughter Marion tested recipes and made the illustrations, and they sold their mother-daughter project from Irma's apartment. Today, nine revisions later, The Joy of Cooking -- selected by The New York Public Library as one of the 150 most important and influential books of the twentieth century -- has taught tens of millions of people to cook, helped feed and delight millions beyond that, answered countless kitchen and food questions, and averted many a cooking crisis. Ethan Becker, Marion's son, leads the latest generation of JOY, still a family affair, into the twenty-first century with a 75th anniversary edition that draws upon the best of the past while keeping its eye on the way we cook now. It features a rediscovery of the witty, clear voices of Marion Becker and Irma Rombauer, whose first instructions to the cook were stand facing the stove. This edition also brings back the encyclopedic chapter Know Your Ingredients. The chapter that novices and pros alike have consulted for over thirty years has been revised, expanded, and banded, making it a book within a book. Cooking Methods shows cooks how to braise, steam, roast, sauté, and deep-fry effortlessly, while an all-new Nutrition chapter has the latest thinking on healthy eating -- as well as a large dose of common sense. This edition restores the personality of the book, reinstating popular elements such as the grab-bag Brunch, Lunch, and Supper chapter and chapters on frozen desserts, cocktails, beer and wine, canning, salting, smoking, jellies and preserves, pickles and relishes, and freezing foods. Fruit recipes bring these favorite ingredients into all courses of the meal, and there is a new grains chart. There are even recipes kids will enjoy making and eating, such as Chocolate Dipped Bananas, Dyed Easter Eggs, and the ever-popular Pizza. This is the JOY for how we live now. Knowing that most cooks are sometimes in a hurry to make a meal, the JOY now has many new dishes ready in 30 minutes or less. Slow cooker recipes have been added for the first time, and Tuna Casserole made with canned cream of mushroom soup is back. This JOY shares how to save time without losing flavor by using quality convenience foods such as canned stocks and broths, beans, tomatoes, and soups, as well as a wide array of frozen ingredients. Cooking creatively with leftovers emphasizes ease and economy, and casseroles -- those simple, satisfying, make-ahead, no-fuss dishes -- abound. Especially important to busy households is a new section that teaches how to cook and freeze for a day and eat for a week, in an effort to eat more home-cooked meals, save money, and dine well. 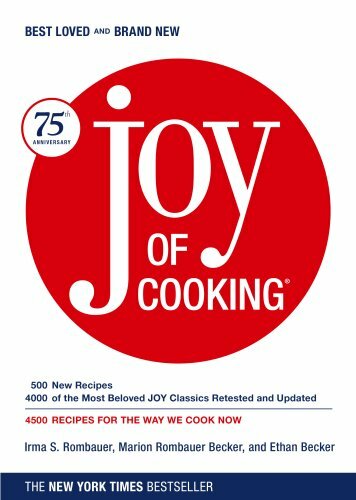 As always, JOY grows with the times: this edition boasts an expanded Vegetables chapter, including instructions on how to cook vegetables in the microwave, and an expanded baking section, Irma's passion -- always considered a stand-alone bible within the JOY.